I found some really funny horse pictures that I want to share with you. These horses are not your ordinary horses and are doing some things that are just down right amusing. I hope you enjoy them as much as I did. 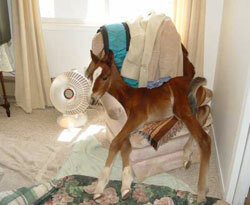 This little horse baby loves to stay in his owner's house, instead of the stable. I think that the house is turning into a stable. What do you think? 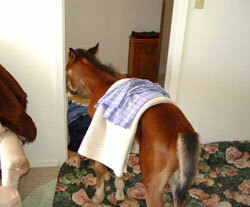 Would you ever think of keeping a horse in your house? What will they do with the pony once it starts to get big and needs more space? These two buddies couldn't be more different. They kind of remind me of the movie "Twins" with Arnold Schwarzenegger and Danny Devito. 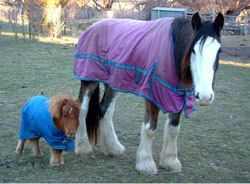 This is a real live horse, maybe the smallest horse in the world. 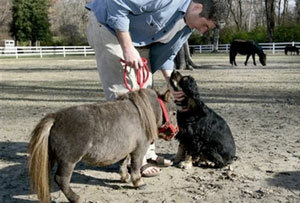 I wonder if celebrities will ever carry around tiny horses instead of tiny dogs? Move From Funny Horse Pictures Back To Your Horse Stories.